This is a pre-certified Passive House on the road to Net-Zero located in Halifax. It is situated on a new street, with new houses, in a neighbourhood with code built basic construction, which makes it interesting for the community. The Dunvegan Passive House presents good competition for the code built houses as it is cost comparable while demonstrating cutting edge energy performance. The design and energy consulting for this project was accomplished by Passive Design Solutions. Passive Buildings Canada member, and founder of Passive Design Solutions, Natalie Leonard describes how Passive House construction competes with mainstream home construction. Passive House (PH) is economically viable. The goal of building this PH within a code built community is to show how relatively inexpensive and economically competitive it can be with the house next door. Building to the PH Standard can usually add 5-10% to the budget, but smart design can bring this cost down. Because of it’s recognized value, this home sold for $30,000 more than the house next door which is a slightly larger code-built home. This increase in sale price was greater than the incremental cost to upgrade the construction to Passive House. 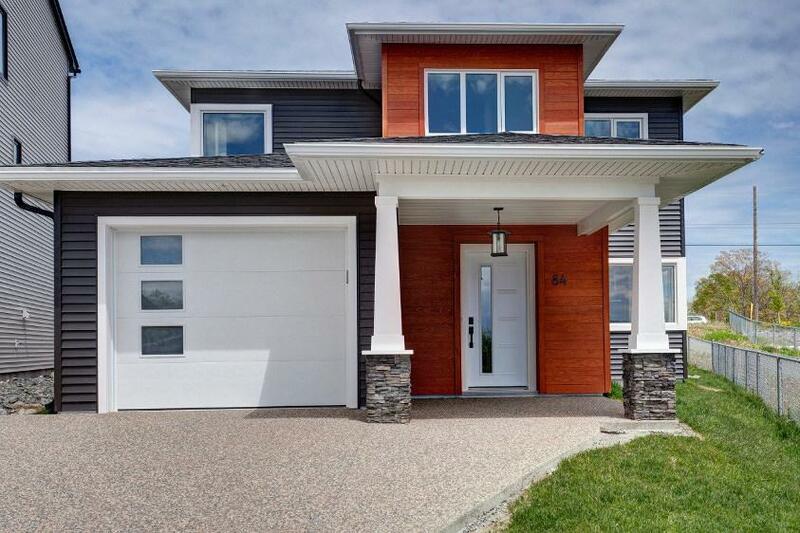 The annual heating cost is estimated to be $250 for this 2290 sqft house with four bedrooms plus a den. In addition to energy savings, there is also a mortgage rebate and incentives available which help offset the extra construction costs. The fundamental principle of this project was to design to the Passive House standard first then to plan for Net-Zero. 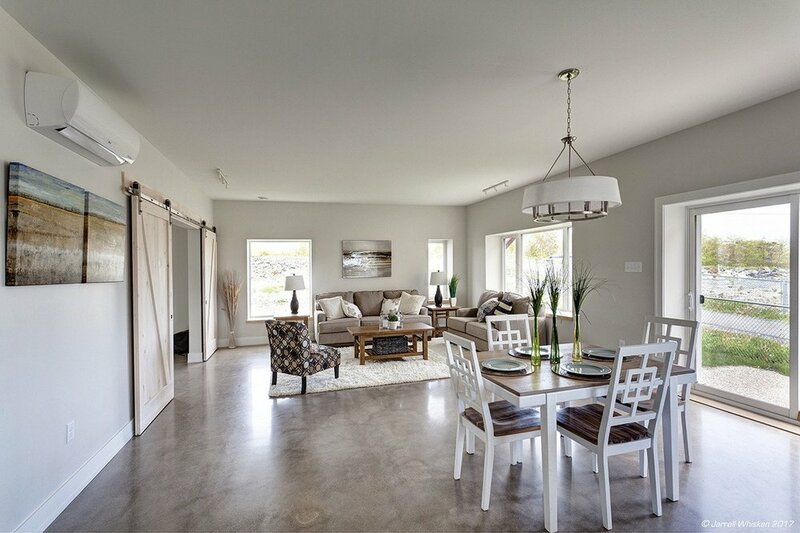 Currently the Dunvegan is a Net-Zero Ready home. The builder has already calculated the amount of solar panels required to make it Net-Zero Energy (NZE). Typically the roof area is the limiting factor for photovoltaic (PV) panels but the Dunvegan accommodates the required number of panels and the trusses have been engineered accordingly. The electrical panel has been sized for PV circuits and the conduit is roughed in from the electrical panel to the roof. The following NZE calculations demonstrate how the cost of these panels’ Return On Investment will only take 10 years at today’s electric rates. With the recent announcement of the solar PV incentive in Nova Scotia this return on investment will be 6 years! After that period this house will be making money for the homeowners. 10 Year Return On Investment at today’s electrical rate. The beauty of Passive House buildings is that the Energy usage is smaller compared to code built buildings meaning they will require less energy reproduction to achieve Net-Zero. This house was built as a testing ground for refining assembly, trying new details, and simplifying mechanical tweaks. The Dunvegan represents one of the stock plans that Passive Design Solutions has created. While Passive House designing can be expensive, these stock plans provide people with an opportunity to build a passive house without costly custom design fees. The stock design options are specific to each solar orientation meaning there is an existing plan that already fits whatever site, location and orientation. A large, south-facing great room brings bright light into the Dunvegan which is uncommon in a neighbourhood where the same plan typically gets reused over and over regardless of orientation. The exterior styling references the classic suburban architecture of the 20th century while matching a similar size and finish within the neighbourhood. Watch out mainstream construction - this smarter way of building is not only low-energy, and sustainable but it is affordable too! Although the Dunvegan exists within a code build neighbourhood, there is no comparison to a home that is built specifically for the location that it lives. By providing stock design options, Net Zero Ready roof systems, and rebate incentives, Passive House affordability competes with mainstream construction.